미세먼지는 광범위한 지역에서 발생하고 전파성이 강해 개인적인 차원에서 그 원인을 제거하기는 어려우므로 국가행정의 개입이 필수적이다. 또한 피해의 원상회복이 어렵다는 점에서 사전예방이 특히 강조된다. 우리나라에서도 미세먼지 관련 법령을 정비하고 특별대책을 시행함으로써 미세먼지 문제를 해결하려 하고 있으나 여전히 부족한 점이 많다. 또한 관련 법령에 따른 행정대책도 법령에 따라 정확하게 시행되고 있지 않은 실정이다. 이러한 상황에서 영국의 ClientEarth v Defra 사건은 우리에게 많은 시사점을 준다. 오염물질 저감에 소홀한 정부 대책에 대하여, 시민들이 법원의 판결을 통하여 법령에 따른 의무이행을 촉구한 사건이기 때문이다. 본고에서는 행정소송을 통하여 행정청에 대하여 미세먼지에 대한 사전예방을 청구할 수 있는 방안들을 검토해보고자 한다. 시민들이 행정소송을 통하여 미세먼지 대책을 촉구하기 위해서는 법적 근거로서 환경기준에 구속력을 부여하는 방법이 검토되어야 하고, 의무이행소송을 도입하여 적극적으로 행정조치를 구할 수 있어야 한다. 또한 소송에 소요되는 비용과 노력을 고려할 때 환경단체의 공익소송의 도입도 아울러 검토되어야 할 것이다. Particulate matter occurs in wide area and harmful to people's health, it is difficult to remove its cause in a personal level, so the intervention of the administration is necessary. And preventive principle should be emphasized because it is difficult to recover the damage caused by health infringement by particulate matter. Although Korea is trying to solve this particulate matter problem by improving the legislation and implementing administrative measures, they are still not enough. In addition, administrative plan have not been properly implemented according to laws and regulations. In this situation, ClientEarth v Defra case gives us a lot of suggestions. In this case, citizens can participate in administrative measures by public environmental litigation. If the government neglects to implement appropriate measures or establishes a poor plan for reducing particulate matter, citizen should be able to sue the agency for their breach of legal duty. This study aim to examine ways to request government to proactively prevent particulate matters through environmental administrative litigation. We suggest give legal binding to the environmental quality standards and introduce the mandatory injunction system which can be useful when government neglects his obligation. 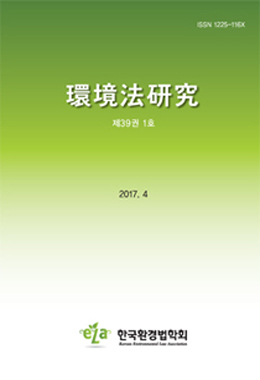 In addition, considering the cost and effort required for environmental litigation, the introduction of public litigation by environmental organization should also be reviewed.